Why was The HighStreet Collective formed? For us, it was a necessity. We love retail. We love the pressure that Amazon has put on it, as it’s forced an old industry to have to think different and break long, closely-held dogma. What we don’t love, however, is that many retailers have chosen paralysis over evolution. Stores are in trouble, but there’s still a window to make a difference. Someone has to help, but that help must be holistic, honorable and equally focused on people and profits. This is the role we humbly wish to serve. What do you mean by Collective? With decades of front-line experience in this industry, we have worked with all types of talent, partners and companies. Many are good. A few are great. We have tapped the few extraordinary people and partners we ‘collected’ — those whose contributions we know, trust and covet as true resource partners. No one can be the best at all things when it comes to retail stores, and those that know retail cold aren’t always the ones to drive unique and unifying shopper innovations. We listen to our client’s challenges and pull together the best and brightest people and companies to populate the engagement team. Think of us as your customized, special forces store SWAT team! *Without the sales pitches. How do you approach store experience? Thanks to e-commerce, today’s shopper has elevated expectations when they walk into a store. Affected by the ease, convenience and transparency afforded by the Internet, human beings need extra reason to get up off the couch, put the kids in the car, fight traffic, find a parking spot and actually walk into your store. The one piece that hasn’t changed is shoppers’ craving for emotional experiences. Many retailers have missed an opportunity to capitalize on this simple, yet powerful human condition. The driver of virtually all our shopping and purchase behaviors is emotion. 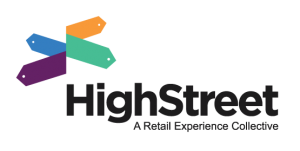 At HighStreet, we apply both qualitative research and our own proprietary research methods to find store friction and areas ripe for enhancement, then follow our Retail Innovation Playbook to create and activate innovative ideas that shoppers will love, seek out and keep coming back for. This all sounds great but how do you prove it? In retail today, we fund well what we measure well. To get a full view of the shopper, you must look at what we call “The Three Lenses of Data”: Behavior, Emotions and Transaction. You can’t ask a focus group to weigh in on something they’ve never experienced and get feedback worth hearing. To truly understand shoppers and their journeys, the store MUST be a key piece of the data ecosystem. Technology is data based—there is no ‘it works or it doesn’t work’. If it’s not resonating, understand why and fix it. These headlines are our measurement foundations. We like to pretend that your CFO is in every meeting that we have. If he/she can feel comfortable with our methods towards insights, valuation and optimization, we’ve done our job. We get the importance of hard-nosed data and soft human indicators--they are equally important, but in the end, retail stores are in business to sell. Haven’t interactive agencies, ad agencies and store design firms/architects been dabbling in this space for years? Yes, they have. But we’re frustrated that it hasn’t resulted in more rock star case studies. Think about it, how often are you asked what retailer has truly blazed a trail with in-store technology and reinvention? Certainly not enough. It’s true that interactive designers consider the user experience within the browser, agencies imagineer experiences across lots of touch points and store firms/architects create magical things within the physical store. And we partner with these kinds of specialists all the time. But, again, they are all needed at certain moments within the store innovation process as inputs, not orchestra directors. What we deliver is cohesive vision, process, plan and optimization strategy that can be executed against as a collaborative group. Are you a part of an agency network? Many of us have worked for agency holding companies and understand their inherent limitations and the frustration they create for clients. That’s why we think our independence is important because it enables us to collaborate freely with an expert talent pool to build totally new experiences for clients without the constructs of the past. This ‘talent without territories’ ethos is a part of our culture, and believe it’s one of the most important benefits of working with us.